GAZZA AND Lindisfarne. New Order and Keith Allen. The Farm and Harry Cross. Yep, pop music has thrown up more than its fair share of unlikely alliances, but 808 State were within a hair's breadth of topping them all. Martin Price, a man generally regarded as having the "biggest mouth in Manchester", a tag he heartily disapproves of, tells the story. "A friend of Graham's (Massey, 808's electro-boffin), Demon Dave, who also does Morrissey's hair, told us that Morrissey didn't like house but thought that 'Quadrastate' was melodic and different. "Morrissey intimated something to Demon, who passed on the information to us," he continues. "We were sat around talking about it one day when someone overheard us. The news subsequently appeared in the press as, 808 State to boost Morrissey's career, which annoyed him. So a collaboration didn't happen. "We could have been the first ones to have done an indie crossover, and we'd have loved to have done it. I respect the guy. I respect him more cos he's stuck to his guns and believes in what he's doing." KIND WORDS. Especially when you consider that Price hasn't always been quite so magnanimous towards his indie contemporaries - particularly those who, in a desperate bid to keep up with the times, suddenly decided to namecheck Afrika Bambaata rather than The Byrds. When The Late Show chose to run an item on the burgeoning indie dance 'movement', Price turned a rare shade of purple, venting his spleen at every available target, implying that musical barriers should once again be resurrected. Today, though, rage has dwindled to remorse. So why the change of heart? "Basically, all that stuff got blown out of proportion," claims Price. "We just went mad. We were wrong to do it, we know that now. We were, and always have been, positive about these people. It was just that there were these glaring inaccuracies and everyone saw them. "I trade in this stuff. I make these people's careers cos I buy these records for my shop (Manchester's Eastern Bloc). When it was all changing I just thought it was really funny seeing them change their minds. It's a good thing that they have, but now and again you feel a bit cheeky about it. "I've been very negative about it, but a lot of 'em are good. The Farm are good. I like a few Andy Weatherall things. The Primal Scream one. I've got a lot of respect for them, they're promoting the dance scene just as much as we are. We don't feel it belongs to us, it's there to be shared." "It's caring too much, that's the problem," interrupts Darren Partington, who, along with the far quieter Andrew Barker, operates the record decks. "We've been there from the start - back in '88, and before that when me and Andrew were into hip hop and he (Barker) was also into soul and reggae. When someone comes along and takes a bit out of your scene you're gonna shout, aren't you?" AND SHOUT, they most certainly do. 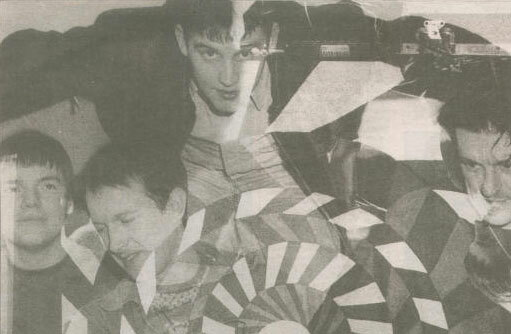 Scheduled to perform their sparkling new single, 'Cubik'/ 'Olympic', on The Word 808 State are in ebullient mood. 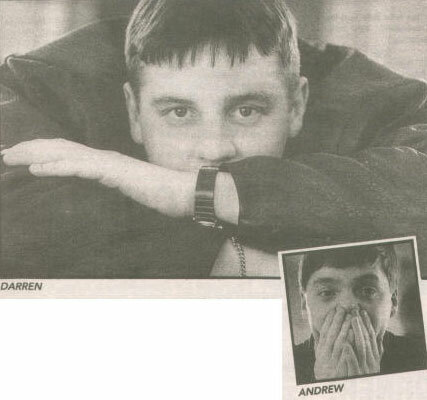 While Graham prepares the band's equipment, Martin, Darren and Andrew are confined to their dressing room, turning their attention from the imminent assassination of Terry Christian (The Word's frighteningly chirpy presenter) to the sorry state of heavy metal bands ("You can't tell the birds from the blokes. I take one look and think, Aye, aye, what's your game?"). That 808 State exude such confidence should come as little surprise. Late '89 saw the release of their widely acclaimed debut album, 'Ninety', as well as collaborative projects with MC Tunes ("I'm telling you, he was brought up by his mother and a monkey") and Jon Hassell, an avant-garde composer, jazz trumpeter, and associate of Brian Eno. Whereas 808's association with Tunes saw them light up Top Of The Pops in the form of 'The Only Rhyme That Bites', their partnership with Hassell, on 'Voiceprint', was a far more low-key and off-beat exercise. Do they feel an affinity with him? Price: "I think some years ago, when he was messing about with tape loops and stuff, we'd have had some sort of empathy with him. But not now, it's too highbrow. "Why not be in all markets? Why not reach a lot of people? It's the sort of music you've got to have very expensive drugs for and a massive hi-fi. I've got the hi-fi, but I can't afford the rest." While 808 remain wary, then, of marginalising themselves by taking their innate inquisitiveness too far, they have nothing but contempt for those who continually opt for the easy answer. To paraphrase Darren, if you're not prepared to experiment, then why bother? "Big bands like The Rolling Stones and Genesis have got millions of pounds worth of technology," he says, "but what comes out the other end just sounds like what they were doing before. Come on, what's the point? "Dance music hasn't got any limitations. There's no boundaries, there's no one holding you back. You can do exactly what you want to f**king do." Perhaps you can, but the fact remains: plagiarism equals big bucks. "Yeah, I've got 49 'Cubik' rip-offs," confirms Price, "all using the same sound, the sound we invented. That sound's cropping up on every record at the moment. We're waiting for the 50th, which we'll tie a bundle around and say to our lawyer, Here y'are, get 'em sued." Currently in the process of recording their follow-up to 'Ninety', which will be released in two 12-inch formats, 808 State realise their next move is likely to bring gasps of bewilderment from the record company, not to mention ripples of gratitude from Guru Josh. "Record companies don't understand you can be producers/artists," says Price. "The whole industry is about nine light years behind what's actually happening. "They actually compared 'Pacific State' to Acker Bilk! That's all they know. Y'know, When's your next clarinet tune coming out? We let Guru Josh bring out the next 'Pacific State' for his first single. And his second. And his third. We weren't going to do it again. We can't repeat ourselves." Whether Gazza can say the same thing is another matter entirely.